This week has gone by in a blur, mainly because Little Miss has not slept well and came down with some icky stomach bug. So of course none of us slept well. She was better today so we were off to our Mom and Me Scrapbook class. Our last hurrah since the next one is scheduled after she starts kindergarten. Today was part two of the ScrapTiffany reveal. This week's challenge was self portrait. Here is my layout using bits and pieces of Echo Park's A Walk in the Park. I love this new line and can't wait to see everything Echo Park has coming out in July. 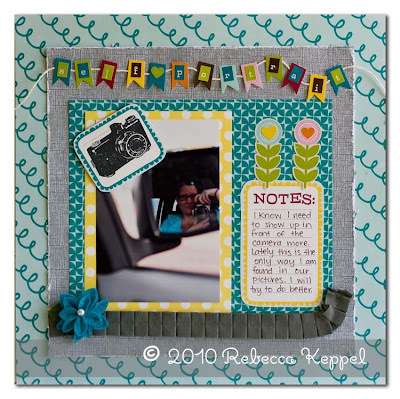 Go on over to ScrapTiffany to check out the other self portrait projects. I've been crazy busy working on some things that I won't be able to share for a while, but I'll be back soon. Until then...have a great weekend! Love your layout with Echo Park. Was the Mom and me class at Scrapbooks Etc? I happened to stop by there today at lunch and saw they were having one. Hope you had fun! Fabulous layout, love that paper line. I can't wait to play with that. The colors are fabulous!!! I love the colors and that banner! Great self portrait, too. Hope you have a great weekend, Rebecca!! ooh I love your page!! its awesome! Very, very cute! Not generally a huge fan of banners but you make this one look GOOD!!! Jealous that you worked with this line... I still haven't gotten any! Terrific design work!